An African Safari Vacation is one of the most unforgettable holiday experiences you will find. Africa is the world’s most sought after safari vacation destination. It has rugged landscapes, vast beautiful wilderness areas, and plains filled with wildlife. On an African Safari Vacation you will encounter four out of the legendary “Big Five“. See lion, African elephant, Cape buffalo and leopard in their natural habitat. 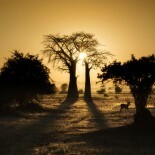 An African safari vacation is a discovery of Africa’s secrets. You will experience the sights and sounds of exotic safari travel. 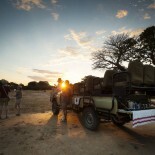 There are various ways of making the most of your African safari vacation. Embark on a guided 4×4 game drive at dawn when the world is still at peace, loose yourself in the sunrise and visual splendour of a land preparing to welcome the day and be there when the buffalo first wakes up. On a walking bird safari, our expert guides will accompany you as you experience Africa on foot, exploring the myriad of flora and fauna while taking in the kaleidoscopic landscape and abundant bird and wildlife that surrounds you. Experience African wildlife by canoe. Our guests are invited to paddle along the Zambezi river with an expert guide for a truly phenomenal and exhilarating water safari. 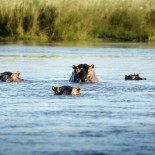 Encounter crocodiles and hippopotamus, elephants, buck and birdlife while enjoying the tranquility of the bush by boat. A experience at our Safari Lodge is game fishing on the Zambezi. This unspoilt stretch of water has always attracted wildlife enthusiasts and sport fishermen. It is home to the legendary tiger fish. Our Safari Lodge offers guests a choice between bait and fly fishing, Tiger Fishing and Bream Fishing. 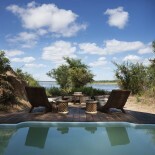 The Mwambashi River Lodge is ideally situated for an African Safari Vacation on the banks of the Zambesi River. See the map below.